The Smart Hyde Park View offers hostel accommodation with spacious rooms and free WiFi throughout the premises. The building itself has listed status. The dormitories have lockers and a private bathroom with a hairdryer. Private rooms are also available on the top two floors which come with a satellite TV, telephone, safe, Shower/Bath, toilet, heating, Hairdryer. Private rooms have lift access. On the ground floor is a lounge bar with comfortable seating, a flat-screen TV and selection of beverages and snacks. On the lower ground floor is a common room with sofas and a colour television with Sky free-view, as well as a multitude of dining tables. The bar has theme nights and party nights. he bar will serve guests in their rooms 24 hours and is open 11.00 till 04.00. Continental breakfasts are served daily. The front desk of the Smart Hyde Park View Hostel is manned 24/7 where items such as towels, adapters and batteries are available. The hostel has a lift. Safety deposit boxes and luggage storage available. Services offered include laundry, ironing, currency exchange and fax/photocopy services. Nearest: Tube Station: Queensway 0.2 miles (0.3 km), Railway Station: London Paddington 0.4 miles (0.6 km), Motorway: M4 Junction 1 4.4 miles (7.1 km). There are 4 tube (underground) stations within half a mile (0.8 km). Situated just off from Bayswater the Smart Hyde Park View Hostel London is in a central location. Strolling distance from Hyde Park (less than 200 yards) and close to great shopping, cafes, bars and other amenities at Queensway, Notting Hill and Kensington Church Street. A taxi can always be found on Bayswater Road and bus and train links are also good. 5-minute walk from both Queensway and Bayswater Underground Stations. Nearest attractions include Kensington Palace (0.6 miles), Serpentine Gallery (0.6 miles), Portobello Road Market (0.8 miles), Royal Albert Hall (0.8 miles) and Marble Arch (1 mile). Compared to other London hotels: This hotel has been rated 71% by past guests. The London average is 80% and the average for 2 star hotels is 68%. Therefore while the hotel is below the overall London average you should note that this hotel is above average for its sector (star rating) . Milesfaster ranking: 701st from 866 London hotels, and 33rd of 70 two star rated hotels. Another to Consider: Another hotel that is much like the Smart Hyde Park View Hostel and not too far away (2.3 miles, 3.7 km) would be the 2 star Wardonia Hotel, where prices begin from around £76 and which has a 74% guest satisfaction rating. Would you prefer to go with something that has scored higher in guest satisfaction ratings? If that is what your after then the 3 Star Motel One Tower Hill seems like a possible option. The Motel One Tower Hill is only 0.2 miles (0.3 km) away. A highly rated hotel with a guest score of 90%. 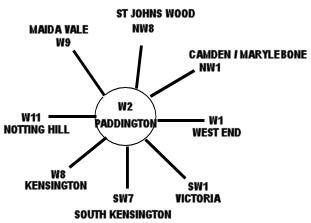 The 50 nearest hotels around this area (16 Leinster Terrace, W2 postcode) which we have have on our website extend out to a 0.5 miles (0.7 km) radius. The numbers by star rating are 1 five star hotel (rated 89%), 22 four star hotels (average rating 81%), 19 three star hotels (average rating 70%) and 8 two star hotels (average rating 66%). Top 2 star hotel is Caring Hotel at 80%. Coming out as the top rated hotel is Royal Park Hotel (4 star) at 90%. Base Rates: We compare area starting room rates by using base rates. Bear in mind we use the published base rates which do not reflect short term offers and deals. They do however give a decent relative comparison. Looking at all hotels in the area the average base rate is £105 per night. They range from a low of £11 at Smart Hyde Park View Hostel (this hotel) (2 Star, 71%) up to £720 at Commodore Hotel (4 Star, 60%). Rates break down to the following for each star rating: Five Star average: £269, Four Star average: £149, Three Star average: £72 and Two Star average: £43. Using our in-house algorithm we rank hotels based on guest ratings and weighted for related factors. We have a ranking for Smart Hyde Park View Hostel 31st (joint) of 50 and 2nd for the 8 two star hotels in the area. Our base rate rank for the hotel is 1st of 50 (1st of 8 two star hotels.). We use the base rate ranking and review ranking for the hotel to get an overall ranking of 1st of 47 for sheer value for money. The high value for money score (no.1 ranking) is thanks to very low starting rates for a 2 star hotel despite a not so great guest rating. Was called the Craven Gardens Hotel till 2008.